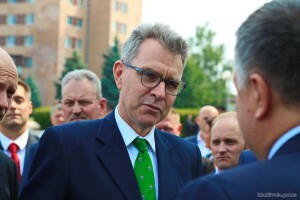 On September 4th, at the International Economic Forum The Ambassador of the United States in Ukraine, Geoffrey Pyatt got acquainted with the process of the preparation of Kharkiv patrol police in the Kharkiv National University of Internal Affairs. The ambassador noted that today Kharkiv demonstrates progress in the implementation of European reforms, the establishment of democracy, and the rule of law. The ambassador said that the United States has made significant investments in the patrol police in Ukraine. All the similar changes are expected in the prosecutor’s office as well. “After all, the project of police will be successful only when the spirit of justice will prevail in the court system and the prosecutor’s office”, – emphasized the diplomat.